Adds Diluted Stimpaks, RadAway and RadX as craftable items at the Chemistry Station. 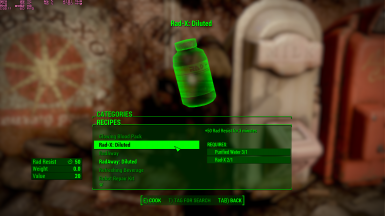 This small mod lets you craft Diluted Stimpaks, RadAway and Rad-X at the Chemistry Station. The items have 50% of the value and also 50% of the weight. 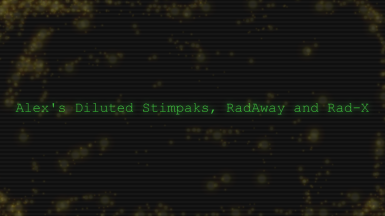 Stimpaks also only uncripple limbs to 50%. Note: Due to the vanilla interface, you don't see the (x2) next to the name. 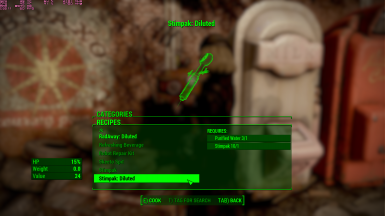 If you use any UI mods, you will see that it actually displays it.